Friday is called Al-Jumu`ah because it is derived from Al-Jam`, literally, gathering. The people of Islam gather weekly, on every Friday in the major places of worship. It was during Friday when Allah finished the creation, the sixth day, during which Allah created the heavens and earth. During Friday, Allah created Adam, and he was placed in Paradise, and ironically, it was a Friday when he was taken out of Paradise. It will be on a Friday when the Last Hour will commence. There is an hour during Friday, wherein no faithful servant asks Allah for something good, but Allah will give him what he asked for. All of this is based upon Hadiths in the authentic collections. In the ancient language Friday was called, `Arubah. It is a fact that previous nations were informed about Friday, but they were led astray from it. The Jews chose Saturday for their holy day, but Adam was not created on Saturday. The Christians chose Sunday, which is the day the creation was initiated. Allah chose Friday for this Ummah, because it is the day the creation was finished. This is the wording of Al-Bukhari in another narration of Muslim; (Allah diverted those who were before us from Friday. For the Jews there was Saturday, and for the Christians there was Sunday. Allah commanded the believers to gather to worship Him on Friday, (O you who believe! When the call is proclaimed for the Salah on Al-Jumu`ah (Friday), then hasten (Fas`aw) to the remembrance of Allah) meaning, go to it and head for it. Qatadah said, "(then hasten to the remembrance of Allah) means that you have to hasten to the prayer with your heart and actions, and walk to it.'' It is recommended for those coming to the Friday prayer to perform Ghusl (taking bath) before they come. It is collected in the Two Sahihs that `Abdullah bin `Umar said that Allah's Messenger said, (When one of you comes to the Friday prayer, then let him perform bath.) The Two Sahihs recorded that Abu Sa`id said that the Messenger of Allah said, (Ghusl on the day of Jumu`ah is Wajib (required) from every Muhtalim. Abu Hurayrah narrated that Allah's Messenger said, (It is Allah's right on every Muslim to bathe during every seven days, by washing his head and body.) Muslim collected this Hadith. Jabir narrated that Allah's Messenger said, (Within every seven days, every Muslim man has the obligation to perform Ghusl at least one day, the day of Jumu`ah.) Ahmad, An-Nasa'i and Ibn Hibban collected this Hadith. Imam Ahmad recorded that `Aws bin `Aws Ath-Thaqafi said that he heard Allah's Messenger say, (Whoever performs Ghusl (well) on the day of Jumu`ah, leaves early, walking not riding, and sits close to the Imam and listens without talking, will earn the reward of fasting and performing standing (in prayer) for an entire year for every step he takes.) This Hadith has various chains of narration, the compilers of the Four Sunan collected it, and At-Tirmidhi graded it Hasan. It is recommended that one cleans his body, performs Ghusl, wears his best clothes, applies perfume and uses Siwak (tooth stick) for Jumu`ah. We mentioned that Abu Sa`id narrated that the Messenger of Allah said, (Ghusl on the day of Jumu`ah is Wajib (required) from every Muhtalim and also using Siwak and applying some of his household's perfume.) Imam Ahmad recorded that Abu Ayyub Al-Ansari said that he heard the Messenger of Allah say, (Whoever performs Ghusl on Friday and applies perfume, if he has any, wears his best clothes, then goes to the Masjid and performs voluntary prayer, if he wishes, does not bother anyone, listens when the Imam appears until he starts the prayer. Then all of this will be an expiation for whatever occurs between that Friday and the next Friday.) Abu Dawud and Ibn Majah recorded in their Sunans that `Abdullah bin Salam said that he heard the Messenger of Allah say, while on the Minbar: (What harm would it cause if one of you bought two garments for the day of Jumu`ah, other than the garment he wears daily) `A'ishah said that during a speech he gave on a Friday when he saw people wearing Nimar garments, the Messenger of Allah said, (When one of you has wealth, he should keep two garments for Friday, other than the two garments he has for his daily wear.) Ibn Majah collected this Hadith. 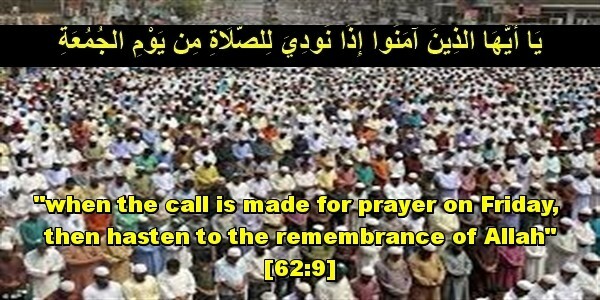 Allah said, (When the call is proclaimed for the Salah on Friday,) referring to the Adhan which was called, during the time of the Prophet , when he came out of his house and sat on the Minbar. The Adhan would be called before the Prophet near the door of the Masjid. As for the earlier Adhan that the Leader of the faithful, `Uthman bin Affan added, it was done because the Muslims increased in number during his time. Al-Bukhari recorded that As-Sa'ib bin Yazid said, "In the lifetime of the Prophet , Abu Bakr and `Umar, the Adhan for the Friday prayer was pronounced while the Imam sat on the pulpit. But during `Uthman's later time when the Muslims increased in number, an additional call was pronouced upon Az-Zawra', meaning the Adhan was called upon the house which was called Az-Zawra''' Az-Zawra' was the tallest house in Al-Madinah near the Masjid.